Before I launch into today’s post, though, let me say a quick prayer for those in the path of Sandy: Father God, we know you are more powerful than the most powerful hurricane, and we ask you to protect those in Sandy’s path. For those who are afraid, please give them a sense of calm. For those who are weak, please give them strength. For those who are facing loss, please give them friends and family to comfort them. For those who are thrill-seeking idiots, please send them a guardian angel and keep the brave folks who try to save them from harm. Thank you for keeping us in Your loving hands during life’s storms. Amen. There are several “good aunts” I want to thank and celebrate to close out the series, including a few of my own good aunts. I’ve spoken early in the series about my great aunts, who really were the grandmothers I needed growing up. 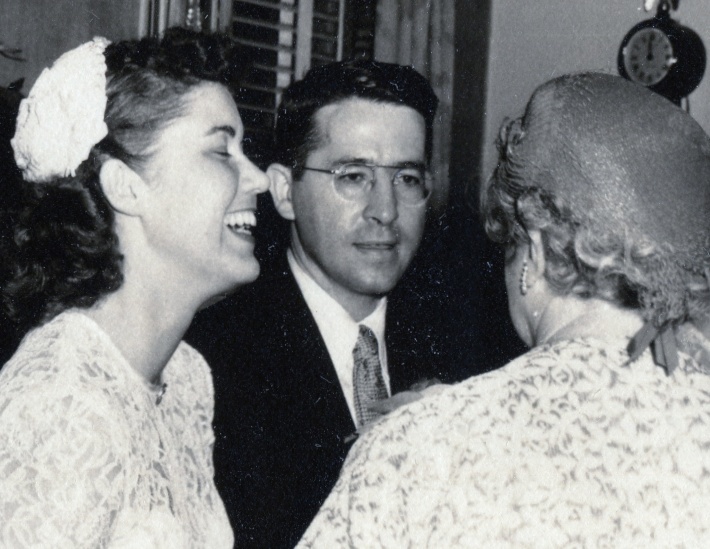 In this picture, one of my closest aunts (my mom’s sister) celebrates her wedding day with her new husband, while my great aunt Clare, right, makes her laugh. My aunt celebrates her wedding day with her own good aunt, there on the right, making her laugh. My aunt Mary Lou was vibrant and smart and loving, and even though she was busy with a full-time teaching job and three children of her own, she always found time to make me feel special. She taught me to love museums and literature and movies and time with family. Her overseas trips taught me about the exciting possibilities of traveling to other countries and experiencing different cultures, and she often brought a small treasure home for me. She was one of the earliest encouragers of my writing, and I wish she were still alive to read my blog, because I know her insights and questions would continue to make me a better writer. How many of you aunts – and uncles – have ever felt this way about your own nieces and nephews? When my older nephew was still the solo kid in the family, I told him constantly that he was my favorite little boy in the whole world. I thought he was perfect, and I was not at all biased, ahem. And then my second nephew was born, and suddenly I had two favorite boys in the whole world (yes, it’s possible to have two favorites), both of whom were perfect. And I loved them more than I imagined I could ever love two people. And I was not biased. Both of my nephews love me (even as teenagers they still tell me this, and not just when I send money or presents), but I have never been a perfect aunt. Lots of times, I feel less than perfect. Like that time I yelled at my older nephew for breaking the cup holder in my car. Or the time I yelled at both of them for fighting in the backseat after a trip to Chuck E. Cheese (which, by the way, was the first time I truly understood how miraculous it was that my father never really followed through on his threat to pull the car over). But I’ve done the best I could to foster relationships with them and make sure they always know that even though I’m not perfect, I still pretty much think they are. Recently I was looking through the statistics page on my blog, more specifically, the search terms that bring readers to my blog. I was surprised and saddened to see this search: “I don’t know how to be a good aunt.” That line stopped me cold. Some woman out there was looking for online help, wanting to learn what it meant to be a good aunt. So she typed, “I don’t know how to be a good aunt” to see what answers might come up. There was something in her search that resonated with me, and I wondered what that woman was going through to make her turn to Google. That could have been me all those years ago, searching for an answer about how to be a good aunt. Let’s be honest. There are still days I could benefit from a magic Google search that has all those answers. My older nephew was born when I was a sophomore in college, making me the first of my friends to become an aunt. I had no clue what being a good aunt entailed. I was busy trying to figure out what being a good college student and a good friend and a good adult and a good human being meant. And now this baby was on the way, and I knew with an unshakeable certainty that I wanted to be a good aunt. Even though I had no idea how to go about becoming a good aunt. Several of the woman I interviewed spoke of a similar feeling of inadequacy, this “less than” feeling that made them doubt I should even group them with other good aunts for the series. In some cases, there are strained family relationships that take nieces and nephews out of reach of aunts who would love to be more involved with them. Sometimes the separation happens because of the demands of an aunt’s career. Sometimes there’s no tangible reason to pinpoint why the aunt/niece/nephew relationship never really takes off. This is true not only with biological relationships but also with the children of a good aunt’s closest friends. If I’ve learned nothing else from the good aunt series, it’s this: being a good aunt is about intention (actively cultivating the relationship in whatever way works) and attention (spending time letting the children know they’re important to you). Beyond that, there’s no magic recipe. There’s no Google search that can guarantee you’ll be a good aunt. There are as many different ways to be a good aunt as there are different aunts and different nieces and nephews. And it may take a lot of trial and error to figure out what works best with the children in your life. You may even discover that what works perfectly with one child doesn’t work at all with another. If you’re really struggling, I encourage you to enlist the help of the children’s parents, grandparents and other aunts and uncles to help you figure this out, too. I think Jennifer Pharr Davis is onto something that may help you, though: start with the belief that your niece/nephew is perfect, and therefore deserving of your love and attention, and together, you’ll figure out a way to forge a strong bond. Have any advice to share about what makes a good aunt? I’d love to hear it. And apparently, there are others out there who’d love to hear it, too. The month of guest posts has ended. The contest is over. And now it’s time for me to say several thank yous. First and foremost, I’m grateful to the four talented (and busy) writers who said “Yes!” when I asked if they would write a guest post for me in September. Please know that I deeply appreciate all of you for adding one more thing to your busy schedules. The results were beyond what I was expecting, and for sharing your gift with me and your inspiring messages with my blog readers, I thank you. Jerel Law, author of Spirit Fighter, blogged about his sister-in-law, an amazing good aunt who thinks nothing of flying the less-than-friendly skies to get from Hawaii to her niece and nephews on the East Coast. Her presence is a soothing, necessary balm as the Law children learn to navigate life without their mother. 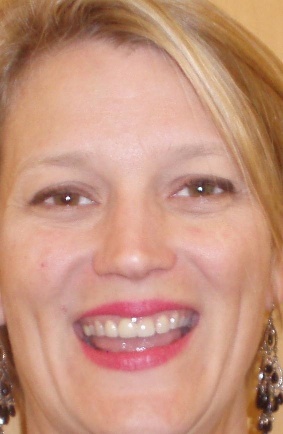 Tracey Finck, author of Love Letters to a Child, blogged about the power of a good aunt’s pen. I hope you took her up on her suggestion to buy some stamps and sit down and write your niece/nephew/significant-other-child-in-your-life to let them know you’re thinking about them. If not, it’s never too late. I hear they even sell stamps at CVS and Wal-mart these days. Allison Cain, author of Revision of a Heart and several other good reads, blogged about a great way to pray about and through pain, whether emotional or physical. And who among us can’t use a good prayer cue for turning our troubles over to God? Shannon Hale, author of How to Pray When You Can’t Sit Still, blogged about her remarkable aunt Grace who had the courage to show her nieces she loved them, even though she couldn’t shower them with perfect gifts or perfect amounts of attention. I hope Hale challenged you to rethink a reluctance to share your love with those who are important to you. 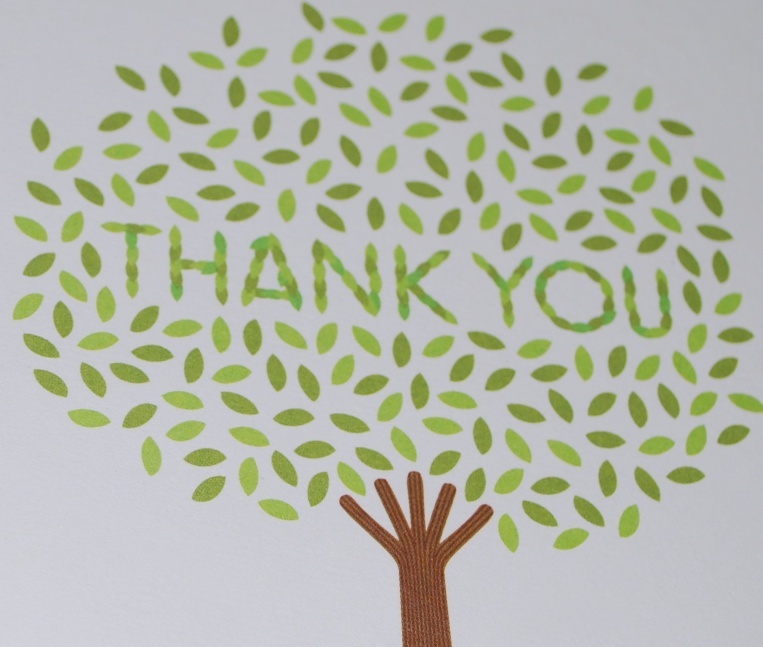 I want to thank those of you who embraced the guest bloggers and commented on their posts. And a huge thanks to those who entered the contest, too. I loved reading stories of your own aunts and how they’ve influenced you. Thank you for sharing those stories, and thanks for taking time away from what I know is a busy month to pay tribute to a special aunt in your life. Thanks also to those of you who have told me about your own good aunts in person. And also to those of you who have spoken of a deep lack of good aunts in your life or a loss of a good aunt in your children’s lives when a sister or sister-in-law died too young. Of those who entered the contest, Wendy ended up winning (congrats!). I was literally pulling her name from the folded pieces of paper when a telemarketer’s number popped up on my caller ID, identifying itself only as “Winner.” Serendipity? Coincidence? Just plain fun (so atypical from the caller ID these days)? You can read Wendy’s tribute to her aunt Kate in the comments to the contest announcement. Wendy is a talented writer in her own right, and I encourage you to check out her blog, especially today’s post that might give you an idea of the type of friend you can be to the moms of your favorite kids. Wendy: look for an email from me in your inbox asking which of the four guest bloggers’ books you’d like to receive as your prize. You can’t go wrong with any of the choices, and I’m looking forward to seeing which one you select. If I could declare each and every one of you readers a winner, I would, but I don’t have enough money in the budget to send all of you books. Maybe as a pat on the back for encouraging me, you’ll treat yourself to one or all four of the books highlighted over the last month? If you do, let me know what you think of them. I also encourage you, if you haven’t already, to thank a good aunt in your life. These woman can be easy to overlook, but if your good aunt is still alive, I’m betting she would love to hear your words of gratitude. If you’re struggling with how to be a good aunt, take heart. You don’t have to be perfect to share a lifetime of love with all those special children in your lives. 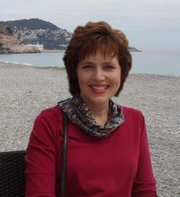 Today’s guest blogger Shannon Hale shares a lesson she learned from an aunt who had the courage to love her imperfectly. 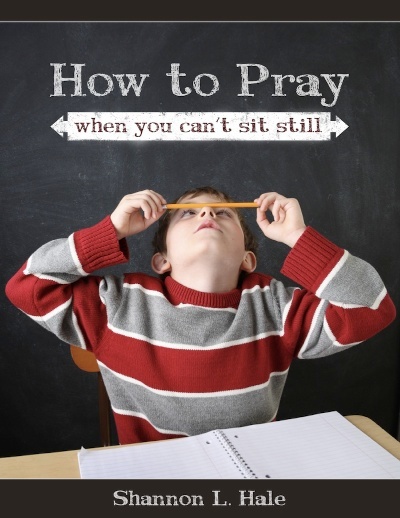 Shannon’s new book How to Pray When You Can’t Sit Still is hot off the e-presses. Her family has learned to live with ADHD, and in her book, she offers fresh, fun new ways to make prayer an integral part of your busy life – a great read for anyone dealing with ADD/ADHD or simply a mind too distracted with the busyness of life to sit down and pray. Be sure to check out Shannon’s blog, too. Today marks the last of the guest posts for the Good Aunt series, and you know what that means: The deadline for the “Thank your good aunt” contest is upon us! I originally intended to stop accepting entries today, but knowing that many of you can’t always find time to sit still and submit your contest entry, I’m extending the deadline to this Friday, September 28. If you win, you could choose to receive How to Pray When You Can’t Sit Still as your prize. So get those entries in that describe a wonderful woman in your life who deserves a letter of love from you. Today marks the second guest post for the Good Aunt series. I’d like to introduce you to my friend Tracey Finck and her gem of a book called Love Letters to a Child. She’ll encourage you to tap into your inner Jane Austen (an aunt who loved to write books but also wrote loving letters to her nieces and nephews). To all you good aunts out there, this book makes a great gift for parents and grandparents, but pick up a copy for yourself, too. Finck’s suggestions and wisdom can translate to nieces and nephews and other important children in your life. You may even feel inspired – as I have – to keep a journal for adults who need to hear your “love letters” to them, too. My friend Kathy vividly remembers a particular day – way back in junior high – when she was going through a miserable stage of life. It must have shown on her face, because a friendly teacher scribbled a little note and secretly handed it to her during class. The note simply said “Choose to smile.” Kathy glanced up at the teacher and saw sincere encouragement smiling back at her. Kathy did smile, and it actually helped her feel better. That small act of loving attention meant so much to her that Kathy has held on to that note – red pen on yellow paper – all these years. The pen is mightier than the sword. It can change the world. And it can change the way a child or teenager thinks.